Posted on Tuesday, June 12th, 2012 at 8:00 pm. After sold-out work-in-progress events in NYC (Museum of Chinese in America) & Chicago (The Public Square, Experimental Station), Kelly is proud and excited to present the very 1st production of her solo show “Formosa” with lights, costume, sound, set, and choreography, etc. A mid-1600s Spanish sailor, an Asian American hip-pop diva, an 8-year-old Chinese adoptee, and a 1960s Taiwanese Barbie doll factory worker collide across time and space in this solo show investigation of beauty, bodies, and Barbie. Inspired by the twenty year history of Barbie doll manufacturing in Taishan, Taiwan. 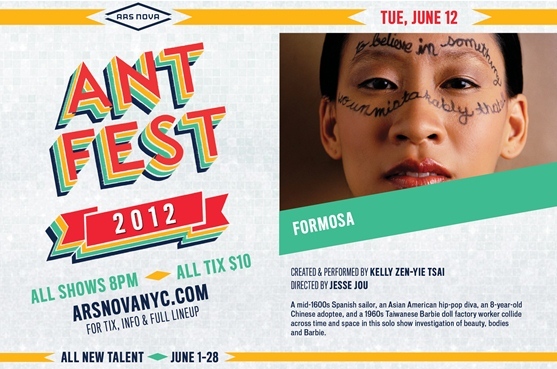 The creation of “Formosa” was supported, in part, through a commission from New York Live Arts’ Studio Series program with support from the National Endowment for the Arts, the New York City Department of Cultural Affairs and the Jerome Foundation and with public funds from the Fund for Creative Communities, supported by New York State Council on the Arts and administered by Lower Manhattan Cultural Council.